February Dawned, Cold and Bright In The Cool Amethyst Glow Of Winter Snowfall. The stately Amethyst reigns as the birthstone of the shortest and coldest month of the year: February. The Amethyst is a stunning purple descendant of the quartz line of gemstones and measures a 7 on the MOHs scale of hardness. Amethyst is thought to embody stability, peace and courage in it's wearer; providing strength and purpose during February's chill. February pays tribute to St. Valentine- the patron saint of romantic love- who wore an amethyst ring carved with the image of a Cupid. The Egyptians also used amethyst as a stone for carved intaglios, and lovers still find meaning and excitement in gifting jewelry featuring the deep purple hues of amethyst gemstones. The amethyst is also the official gemstone for the 6th and 17th years of marriage, and makes a lovely and sentimental present for the love of your life. Amethyst is also often called the 'sober stone'. Greek people drank from amethyst goblets to prevent intoxication from wine. This theory may stem from the legend of Amethyst, a young girl whom Diana turned to a pure clear stone to defend from the rage of Bacchus (God of intoxication). When Bacchus saw what he had done he wept wine soaked tears of remorse and turned the stone of Amethyst a deep purple. It's from this legend that Amethyst became known as a stone of patience and calm, a reminder to think through your actions. 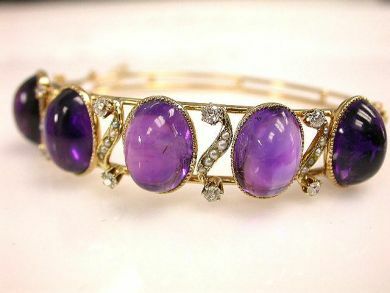 In the Middle Ages the amethyst became the symbol of royalty because of its rich violet hues. The most famous amethyst owned by the British crown is a set of brooches, earrings, necklace and a hair comb that was passed down by-and named after- Queen Victoria's mother, the Duchess of Kent. 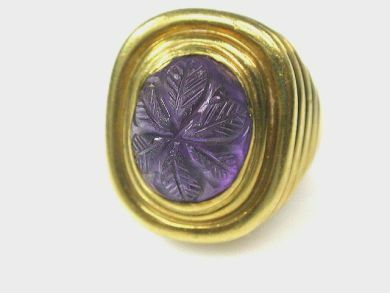 The most commonly seen piece from the 'Kent amethyst' set is a brooch that the queen wears to flatter her purple outfits. 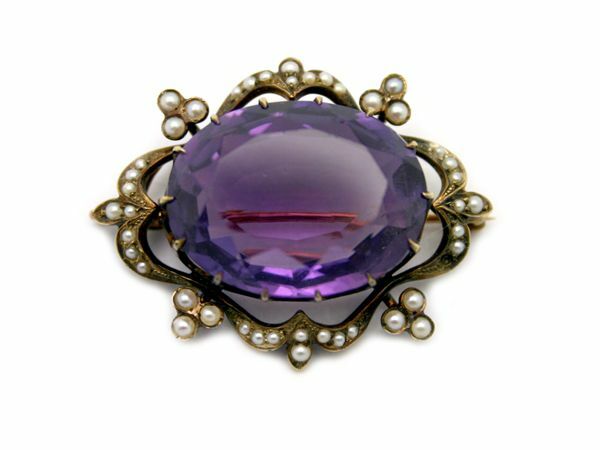 Capture the regal style with Victorian era, amethyst brooches, such as this beautiful one. For a vast selection of February's dazzling birthstone in a rainbow of stunning amethyst shades and settings find us at 284 King St. W. In Toronto.